Born in 1939 in Otaru, Hokkaido, Seiichi Sugano entered the Aikikai in 1957, becoming an uchideshi a year later. He moved to Australia in 1965 to teach aikido, and was one of the pioneers in disseminating the art further abroad through travels to New Zealand, Belgium, and other European countries. 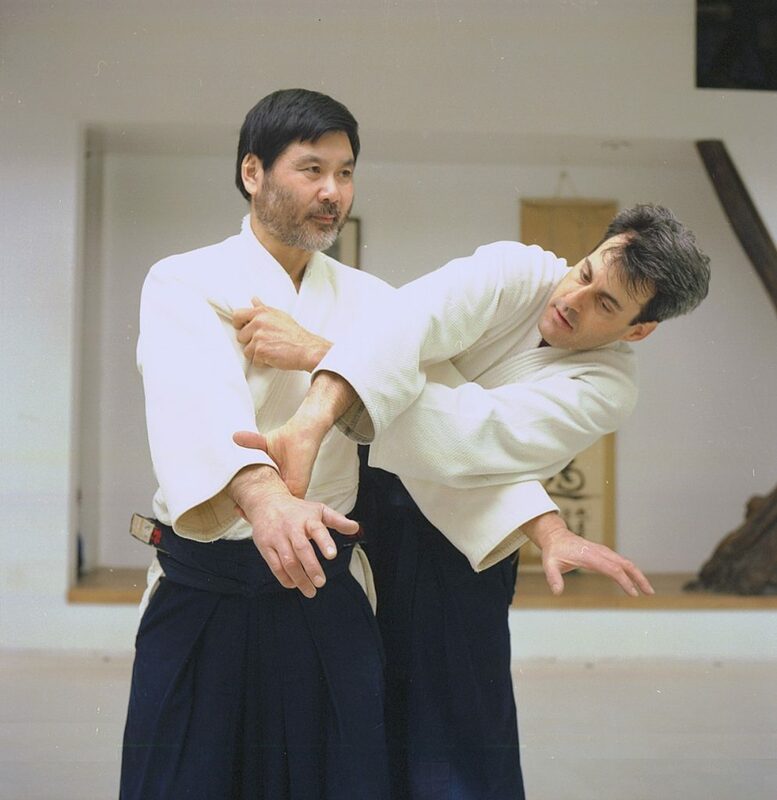 Sugano Shihan (8th dan) taught with Yoshimitsu Yamada Shihan at the New York Aikikai. Sugano Sensei passed away in 2010. AJ: Sugano Sensei, how did you first come to aikido? Sugano: Before discovering aikido I was doing judo. I was interested in budo and happened to see an article on aikido in a magazine. I was around 18 at the time, so instead of going to the university I joined the dojo. About a year later I signed on as an uchideshi. Do you have any particular memories of the old Wakamatsu-cho dojo? The present Doshu (Kisshomaru Ueshiba) was one of the first people I met there. The place had the feel of an old-style dojo; quite different from the way it is today. Most of the time only O-Sensei and Doshu were there. Koichi Tohei was the head of the teaching staff. In the afternoon we were taught by people like Sadateru Arikawa, Hiroshi Tada and Shigenobu Okumura. A few years later Saito Sensei started coming down from Iwama to teach on Sundays. Did you participate in Saito Sensei’s training? Of course. Uchideshi went to all the classes. It never even occurred to us not to attend a class. Practically by definition, being an uchideshi meant that if there was practice you were there training. Different from today, isn’t it? What teacher had the greatest influence on you? To me O-Sensei was the zenith. My training was geared entirely to striving toward that peak. Who else was in the dojo at that time? Kazuo Chiba came about a year before I did. Nobuyoshi Tamura and Yoshimitsu Yamada were also my seniors. Mitsugi Saotome came in about a year after I did. Yutaka Kurita, who is now in Mexico, and Yasuo Kobayashi were both there. Katsuaki Asai lived diagonally opposite the dojo and there were several other non-uchideshi that were constantly at the dojo. Do you have any particularly vivid memories of the individuals teaching in those days? My mind was focused entirely on doing aikido, so I wasn’t really conscious of the high-level teachers around me, or of the interpersonal relationships in the dojo. I was too busy just trying to do aikido. People who have now become teachers themselves often mention teachers like Koichi Tohei and Seigo Yamaguchi. What were your impressions of them? Yamaguchi Sensei really loved to talk. Once he got hold of you it was pretty hard to escape! [laughs] Actually he had already gone off to Burma by the time I became an uchideshi, and he wasn’t back until a year or two later. He and Tohei Sensei were like oil and water. Yamaguchi Sensei had a very strong personality. It was difficult to grasp his techniques — they had quite a different feeling from those of the other teachers — or to capture the essence of what he was doing. 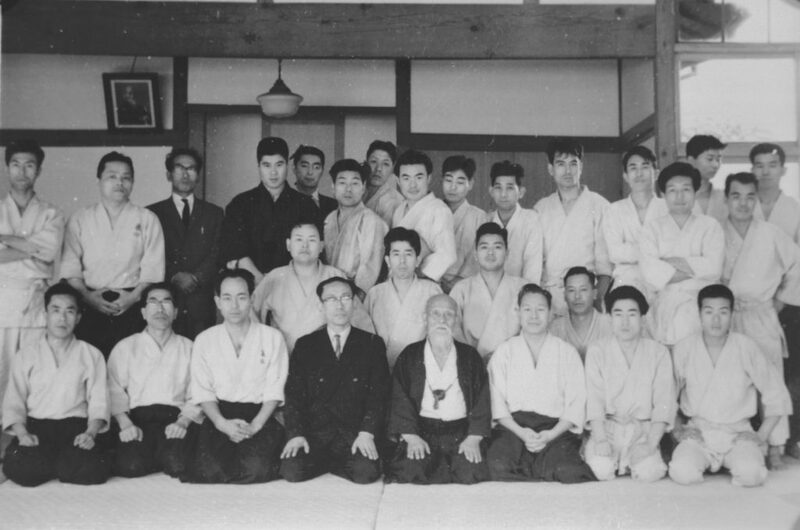 Tohei Sensei’s teaching was influenced by the Tempukai, and it was easier to follow, probably because much of the Tempukai curriculum originated in yoga. Why did you decide to become an uchideshi? I wanted to be able to pursue aikido exclusively. I didn’t have any particular goal to become a teacher or anything like that. I just wanted to train. You entered aikido so soon after graduating from high school. Have you ever had another vocation or profession? No, I haven’t. Soon after I joined the Aikikai my parents cut my allowance, so I had a few part-time jobs but, other than those, I’ve done nothing but aikido. So you found employment at the Aikikai, which you have continued until today? Well, I don’t know if you’d call it “employment” exactly! [laughs] They were just kind enough to feed me! I often ate with Doshu’s family. I think Doshu’s wife had a hard time feeding all the young uchideshi who were around then. She fed us and gave us a bit of pocket money and generally took good care of us. What was life like as an uchideshi? I spent the entire day in the dojo. Nothing but practice and more practice. Later they started sending me out to teach. Aikido was just starting to be taught at various places outside the main dojo, and I went out to teach at universities, at the Japanese Self-Defense Force headquarters and at some of the American military bases around Tokyo, where I had an interesting time. I doubt if many people in the American military had ever seen aikido back then. Did they ever try to test out your aikido to see if it really worked? Sure, all the time. They used to attack me from behind during practice and ambush me as I walked down the street. But there wasn’t any truly malicious intent to this. Going into one of those military bases was a lot of fun because it was like suddenly walking into the U.S. It was hard to believe you were still in Japan. Yoshimitsu Yamada and I used to go to the bases often. What kind of practice did you do there? Pretty much the same sort of thing I do now. Really? I’ve heard that things sometimes got pretty rough and wild. I don’t really remember all the details. [laughs] Some people like to bring up the past and talk about how hard we trained then, but personally I don’t feel particularly interested in talking about those times. I feel that many students outside Japan right now are training with just as much if not more enthusiasm and diligence. But then, I myself have been living abroad, so I don’t really know how things are in Japan now. 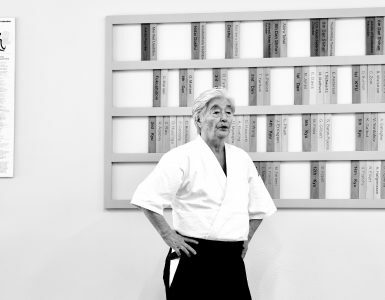 Looking at the spectrum of teachers active in the aikido world today, there seem to be qualitative differences between those who spent time as uchideshi under the founder and those who came later, after he had passed away. I agree. Whenever I go to Japan now I feel as though I am amongst a completely different race of people whose ways of thinking seem entirely different. Or maybe I am the one who has changed. What do you find so different? Many of those doing aikido in the old days skipped higher education to immerse themselves in aikido. These days many of the teachers seem to have waited until they finished college then entered the dojo almost like entering a professional career. The feeling is completely different. Naturally there are generation differences, too, so it’s probably inevitable that the present is different from the past. 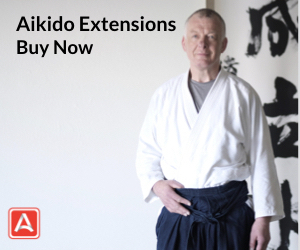 These days there are a lot of different aikido groups and a lot of different ways of thinking about aikido, but at that time aikido equaled O-Sensei. That’s one difference between now and then. Those who went abroad to teach went with the intention of teaching O-Sensei’s aikido. 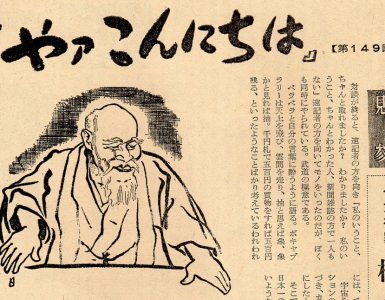 Even now outside Japan you can still find a sense that aikido and Morihei Ueshiba are one and the same, although it’s probably inevitable that this feeling will gradually become diluted. I’ve often heard that many of the uchideshi came up with their own unique training methods; Mitsunari Kanai, for example, used to secretly punch and kick at a makiwara (packed-straw or rope-wound target used in karate training). Yes, there happened to be one behind the dojo. What about finding opportunities downtown to test out the techniques? One hears stories like that, but they tend to change with the telling, don’t they? [laughs] Like that children’s game where someone whispers a sentence to someone else who whispers it to the next person, and by the time you get to the 10th person what’s being said is completely different from the original. There are stories about O-Sensei that have appeared in various books and magazines, which are rather hard to believe. Did you come up with any unusual training methods of your own? No, just the regular training, although for a long time I also used to practice target shooting and marksmanship. There was a rifle range that I used to frequent near Korakuen amusement park. Did you start shooting before or after you began aikido? Around the same time. I practiced pistol shooting for a long time at the American military base in Tachikawa. Target shooting in Japan is limited to rifles and ordinary people don’t get the opportunity to practice with pistols. It was a very good experience. One of my aikido students happened to be a marksmanship instructor, so I used to head off to Tachikawa early to get in some pistol shooting practice before aikido training. You seem to have been dispatched relatively early to teach aikido outside the Aikikai headquarters? Yes, people were sent out to teach in gradually increasing numbers from around 1957. Nobody was really teaching on a professional basis at that time, so there were quite a few opportunities to teach in various places. 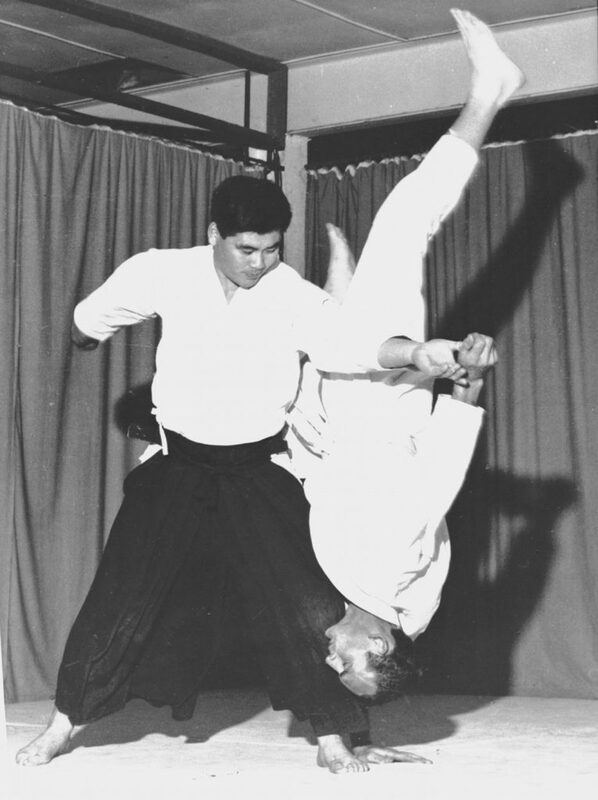 There was the Japanese Self-Defense Force and there were aikido clubs at various universities. I taught at Kokugakuin University for a long time. How was it that you came to live and teach abroad? That was rather early to be going abroad, wasn’t it? Yes, I suppose so. Tamura, Yamada, Chiba, Kanai and I all went abroad around the same time. We didn’t plan it that way; it just happened to work out like that. We all had our own reasons for going, and opportunities just happened to present themselves. It was a time when aikido was starting to expand and grow abroad, but we were not specifically invited to teach in the places where we ended up, so we all had various difficulties. How did you approach your teaching in the beginning? About all you could do was find a space for a dojo, publicize the fact that you were teaching and invite people to come and train. After that it was just a matter of putting time into it. People who had been doing judo and yoga and all kinds of other things came to see what aikido was all about. I gave a lot of demonstrations, sometimes when I was invited to do so, other times on my own initiative. What rank did you hold then? Maybe around 5th dan? I think we were all about 5th dan, except Tamura, who was probably 6th dan by then. Am I right in imagining that many of your students had little compunction in trying to resist your techniques? There were quite a few very strong individuals — people with all kinds of different physiques and degrees of strength. And you could never tell how they were going to move or exactly what they were going to do. I don’t think I would have been able to deal with them effectively using only the kata-style training that we had all practiced in Japan. I think training with other Japanese is a good way to learn elaborate kata (pre-arranged forms), but only if you have a good teacher. If you have a poor teacher, you’ll end up programming yourself with mistaken forms. One characteristic of aikido training is that it does not only involve that kind of practice, although this was the traditional way in Japanese martial arts. The way aikido is taught these days varies greatly from person to person and it’s not surprising that the people learning it are apt to become confused, but this is because aikido does not stick exclusively to kata. The practice of kata as found in Japanese martial arts and in the Japanese arts in general is a means of transmitting specific ways of doing things. Our modern training isn’t like this. It places more emphasis on repetitive practice of techniques. It is much the same type of training that is done in most modern sports, though the concepts on which it is based are different. 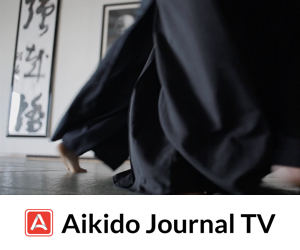 Aikido has grown very quickly, but I don’t think many people realize that one important reason for this is that it has adopted the training methods of ordinary sports. Repetitive practice of numerous techniques is the fundamental training method in any sport. And the training method may vary slightly from coach to coach. Technically speaking, each teacher is likely to have a slightly different feel. The same is true of aikido. Different teachers teach the same technique in different ways. I think aikido has grown in this sense. I think the metamorphosis of O-Sensei’s techniques from jujutsu into aikido was not something he was clearly conscious of, but it was a natural result of his departure from training methods geared toward transmitting kata created in the past. 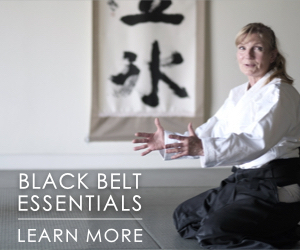 Using kata as a vehicle preserves tradition, but O-Sensei broke away from that method to pursue the modern practice method we have now. His verbal explanations remained very Japanese, of course, which I think is why many people do not realize how modern his approach was. Old ways of expressing things — words like ki and kokyu, for example — may sound very mysterious to foreign ears. 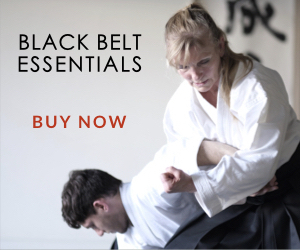 But in the simplest terms, aikido training is a process through which we learn how to use our bodies skillfully, how to work with timing and distance. Training firmly and precisely by performing techniques again and again is the best way to improve. 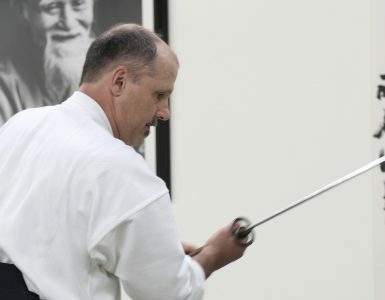 But the fact that various teachers have all created their own personal versions of techniques is a real problem for people trying to learn aikido. Even in the Hombu dojo, for example, you may be taught something different from what Doshu says, and when you take that into the next class the next teacher may tell you it’s a mistake. This sort of thing makes it very difficult for those learning aikido to know what they should be doing. It’s actually because aikido is not strictly defined in a technical sense that many people still tend to cling to certain kata. This lack of definition has resulted in people trying to pin down aikido by insisting that it must be done this way or that way, but I think this only confuses things more. This aspect of aikido may be even harder for people outside of Japan to understand, which makes it that much more important to teach in a more standardized, unified way. Unfortunately, aikido is especially prone to having strong personal flavors attached to it, so achieving this standardization is difficult. In Japan it’s difficult for the student to ask questions, especially of older teachers, and even if you do manage to get up the nerve to ask they often tend not to give you much of an answer. That sort of thing certainly can be detrimental to the learner. The New York dojo is pretty free and easy in that way even compared with other dojos in the United States, but there certainly are places where, depending on the personality of the teacher, students are made to follow various rules and regulations. A major factor contributing to diversity of styles is that O-Sensei encouraged people to cultivate their own individuality. Saito Sensei trains in a very kata-like fashion, frequently emphasizing that O-Sensei did it this way or that way. This approach is the exception rather than the rule, though I think it is a very valuable perspective. Everyone who trained under O-Sensei received something from him and made it his or her own; but very few, if any, actually resemble O-Sensei or do exactly what he did. Coming to strongly resemble one’s teacher is a phenomenon much more likely to occur these days. But this never happened with anyone who learned from O-Sensei, not to my knowledge anyway. Everyone gleaned some important or essential thing from him that they made their own, but none of us have O-Sensei’s bearing or train like he did. Instead, we have all developed our own individual personalities. This result wasn’t intentional. It was just that aikido was O-Sensei and O-Sensei was aikido and you couldn’t get in on that, so the only way to train was to be yourself, to work at aikido from your own perspective. It was the natural result of the kind of teaching we received; it was what we were left with after training under O-Sensei. In creating aikido O-Sensei broke free from the predetermination of kata. His techniques were different every time, as was his way of teaching. The result was that everyone who trained under him developed his or her own individual aikido. If you train in kata-like fashion, after 10 years you will still be doing the same thing, the same form, and there will not have been any development or growth at all. In such a scenario transmission becomes the priority, leaving no room for your own personal progress. As a result of the popularity of aikido various kinds of jujutsu we’d never heard of before have been appearing in recent years. There are literally hundreds of such jujutsu styles, so it’s quite natural that many of them resemble aikido technically. But, whether they develop and grow or not depends ultimately on whether or not they have broken away from the transmission of kata. Styles focused on kata are not engaged in a process of growth. Techniques that resemble aikido can be found in books on European wrestling from as far back as the 14th or 15th centuries. They’re nearly identical, so you can’t say that such things existed only in Japan. I’ve never heard other aikido teachers say the rejection of kata was such a significant factor. Probably they just haven’t thought about it consciously. Please tell us a little more about your views on training? It seems that in nearly all combative arts and sports — boxing, karate, sumo and judo, for example-training methods like shiai (contest), randori (free-style training), or sparring form but a small part of the overall curriculum. In sumo, for example, instead of constant bouts, the majority of training time is taken up with practicing basic elements used in matches. Each of these has a very clear purpose and value. Why does aikido, which supposedly originated in the same combative tradition, not use such basic training methods? From start to finish an aikido training session is comprised almost solely of the practice of techniques. What is the significance of this? How should we interpret it? The main difference is that whereas other budo have competition as an integral part of their training, aikido does not. A match is just another type of training, and if you have matches, then naturally you adopt match-oriented training methods. But aikido doesn’t have matches and consequently it doesn’t include such training methods. In most sports the repetitive practice of various techniques is usually done in conjunction with match training. Karate, judo, and nearly every other budo include matches, so naturally they also include training for such matches. In aikido, however, matches are not the goal, so we are not concerned whether techniques work or don’t work, or with who is stronger or weaker. We don’t use such standards to begin with. Aikido doesn’t fit into any kind of framework that would allow it to be compared with other budo in that way. The fact that aikido is a budo while at the same time lacking such standards of comparison makes it very difficult to establish goals in one’s training. I suppose what I’m trying to get at is that training itself — by which I mean simply continuing the pursuit of repetitive practice, day after day — is the goal, if you want to call it that. You could even go so far as to say that aikido is a path of training — not so much a means of learning techniques, as an ascetic discipline. O-Sensei himself said that all of aikido is misogi (ascetic and meditative practices to purify body and spirit). Failing to understand this fundamental characteristic of aikido and attempting to compare it with other budo using ordinary measures will inevitably make it difficult to understand. Thinking simplistically in terms of techniques being stronger or weaker is a match-oriented way of looking at things and leads you to view aikido in a comparative light. Since modern aikido is not clearly defined and does not include matches it is extremely difficult to identify any objective within one’s training. The result is that a great many people are left wondering just what they are training for and what their goals should be. Many people would like to know, for example, what kind of training a particular sensei did to become powerful. Currently there are no opportunities at the Aikikai Hombu Dojo to learn aikido jo and ken (staff and sword arts). But I presume you and others of your generation learned paired sword practices like ichi no tachi, ni no tachi, and san no tachi, as well as jo sabaki? I’m not really sure how to explain the situation. O-Sensei didn’t teach those things. Yes, he used the sword and jo, but only, I think, as a means of expressing his aikido. O-Sensei used such weapons during demonstrations and special training sessions, but to my knowledge he never formally taught them. I was with O-Sensei and trained under him for a long time. I took ukemi for him when he used weapons in his demonstrations, so I am personally familiar with what it feels like to use them. But from the Hombu’s perspective the only reason to practice with weapons is that the aikido curriculum includes weapons-disarming techniques. So while you say that weapons are not being taught at the Hombu Dojo, I think it would be more correct to say that O-Sensei himself did not teach weapons techniques. In Japanese we have the expression, “If you want mochi (pounded rice cakes), go to a mochi shop.” If you want to do sword training then take up kendo; if you want to practice sword drawing, then do iaido; if you’re interested in the jo then do jodo. These are specialized arts and I think it’s fine for aikido not to include them. Different aikido teachers are teaching various different things these days, but the content of their teaching has come from their individual experience. It would be a different matter if O-Sensei had considered weapons important enough to leave us with specific weapons kata for the purpose of passing them on, but he did not. If O-Sensei had thought weapons were an important part of aikido training, he would have left us with clearly identifiable forms. I don’t think he felt that way, and that’s why he didn’t teach such forms. Some people say that aikido techniques originated from the movements of the sword, but I think it’s really difficult to say one way or the other; in many ways it’s one of those ‘chicken and egg’ conundrums. Aikido techniques were developed in the context of a warrior society in which weapons played a constant role in daily life. On the other hand, thinking about it that way will lead you to discover many technical inconsistencies in the aikido curriculum. For example, some of the more judo-like versions of koshinage (hip throws) would be quite difficult to do if you happened to be wearing a pair of swords at your waist. Do you have any particularly memorable anecdotes about O-Sensei? It seems like I should, but it’s hard to recall. I often used to read aloud to him before he went to bed. He liked historical novels. Whenever there was a fight scene he would say things like, “I can do that!” or “I’d do it even better!” [laughs] Unfortunately I don’t remember the specific titles. Did O-Sensei say things that were difficult to understand? I found it difficult to understand him when he used Omoto ideas and doctrines to explain aikido, because they were very vague. Someone with a deeper knowledge of Shinto probably would have gained a better understanding than I did. He was speaking in Japanese, of course, so I understood the words, but it was the way he expressed things that was difficult to understand. It was difficult to follow his logic, to feel that I had really grasped his meaning in a coherent way. In the same way children may not understand precisely what their parents are saying, even though they do in a general sense. O-Sensei was also from a different era, so he communicated in a somewhat different way. I’ve often heard that he sometimes had a quick temper. I wonder what kind of thing set this off? What were your impressions of O-Sensei the first time you met him? How were O-Sensei’s demonstrations and techniques different from those of the other teachers? As I said before, O-Sensei was aikido, so there really couldn’t have been any comparison. It was almost as if O-Sensei was doing aikido while everyone else was doing something else. There seems to be a difference in the feeling of training today and the training then, or perhaps in the way aikido is and was perceived. In those days if you were talking about aikido you were talking about O-Sensei. There was only one. Now we have all sorts of organizations and many prominent teachers, so you get this sense of comparison; but this would never have occurred to us in O-Sensei’s time. Sugano Sensei, thank you very much for your time and insights. This is by far one of the best interviews of a former uchideshi I have ever read. Sugano Sensei expresses himself in such an honest way and you might be surprised at his answers to the question Stan asks him. Thanks Josh for reposting this great article! The years I trained under Sugano Sensei 1975/77, in the Sydney Wooloomooloo Dojo, I remember him as quiet and sensitive in his communication with his students, especially us junior members. It was a small dojo with a small group, a handful of Dan Grade members and fewer Kyu grade level. The magority of AikidoKa at that time were in Melbourne. He inspired a feeling in me of always looking forward to the next class, though I don’t recall ever having physical contact with him. Contact was only through the dan grade seniors.